Make Travel a Million Times Easier. — ecobabe. It’s officially Spring Break!! Even though this doesn’t currently apply to me lol, I know it does to many of you. And even though I totally miss those good ole days kickin it on a beach somewhere with my college besties, I also know nowadays, Spring Break is usually synonymous with a fun vacation with the kids, a quick getaway with the hubby or even a nice relaxing meditation weekend with your girls. You’re in the same boat right?? * By the way, if you are going to a beach for pina coladas + girl time, GOOD FOR YOU. EITHER way, no matter who we are or where we are in our lives, Spring Break usually means… TRAVEL. Duh duh duhhhh. Travel can be really terrible — stressful — melt down-y. Especially when you’re toting along young kids, animals, a frustrated husband, etc. etc. And because I’m a messy middle child who is naturally very unorganized on TOP of all that, travel for me can be like one of those dreams where you watch all your teeth crumble and slowly fall out of your mouth (have you had those!!). AKA, an absolute nightmare. So, because I live across the country from my family + just because well, I love experiencing other cultures + believe its the best thing you can spend your hard earned money on, I’ve ended up traveling a LOT in my lifetime. World wide, state wide, you name it. And a lot of the time, it’s been with an animal or that frustrated husband! But by the time I hit that airport sidewalk, it’s pretty much smooth sailing. Well, it’s something that people don’t put much thought into but definitely should. It’s something that affects your entire trip, from start to finish. And it’s something you’re going to be SO happy with, once you start. Basically, it’s all about what you bring ON to the plane. Not what you check underneath it. OK ok this may seem like a no brainer but seriously, the better your carry-on, the better your trip!! Let’s start off with your bag shall we? You need a bag that’s big enough to carry everything your little heart desires for your flight, yet small enough to not be super annoying. And of course, it must be both eco + budget friendly. Enter: RuMe. RuMe stands for ‘reuse me’ + was established on Earth Day a few years back. I love this company for their fun, simple solutions to everyday headaches… like travel! ✖️ My RuMe is also big enough to store my valuables, jewelry, clutches… I’ve even carried on shoes. I have had expensive items stolen from my checked luggage. Never again!! Those items now go in My RuMe, on the plane, right by my feet, safe + sound. ✖️ Being handsfree at the airport is CRUCIAL. My RuMe also fits my everyday purse, on top of all those things I’ve already stashed inside (above). 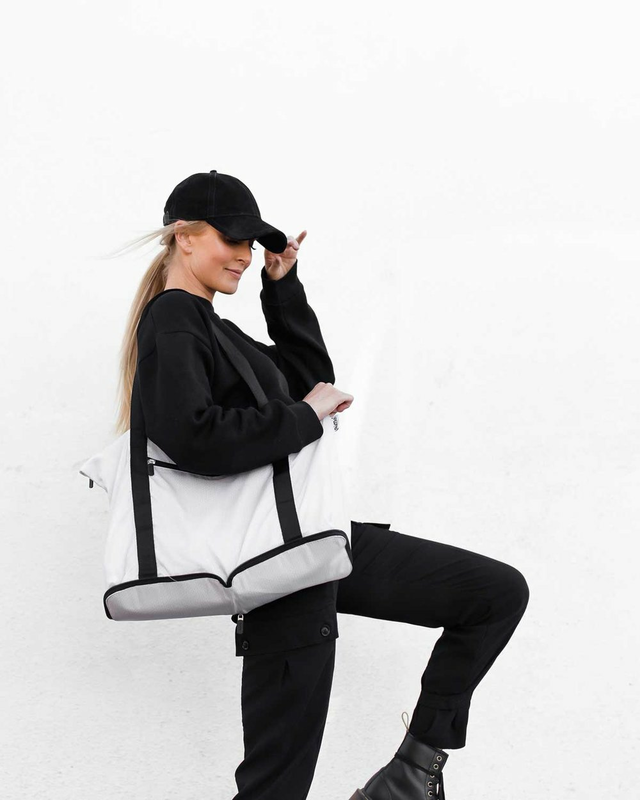 You don’t need to be carrying TWO bags. But your everyday purse is probably too small to carry all these items. So, put that purse inside your RuMe. ✖️ Speaking of handsfree, My RuMe then unzips to slide right over my luggage handle. Brilliant. ✖️And once I land + get settled, My RuMe folds up nicely into one tiny little square. Extra Brilliant. Now, if you have your purse inside your RuMe, this means your passport, money, etc. are ALSO inside your RuMe, zipped up inside your purse. Sounds difficult to access huh? Well, I guess it is because I have literally seen grown adults having full blown panic attacks at the check-in desk fidgeting everywhere to find their license, credit cards, etc. Full blown panic attacks. That’s why you don’t do that. Instead, you grab a Baggie All (because you know us ecobabes DON’T do plastic baggies) + fill it with all those things you’ve seen those grown adults lose: your license. your cash. your credit cards. your plane tickets. Then, you add the makeup you can’t live without. For me, this means mascara, brow pencil, lipstick + my compact. Plus my rose water spray, eye gels + meds or vitamins. Oh, also floss + deodorant! Add your keys, headphones + whalaa! 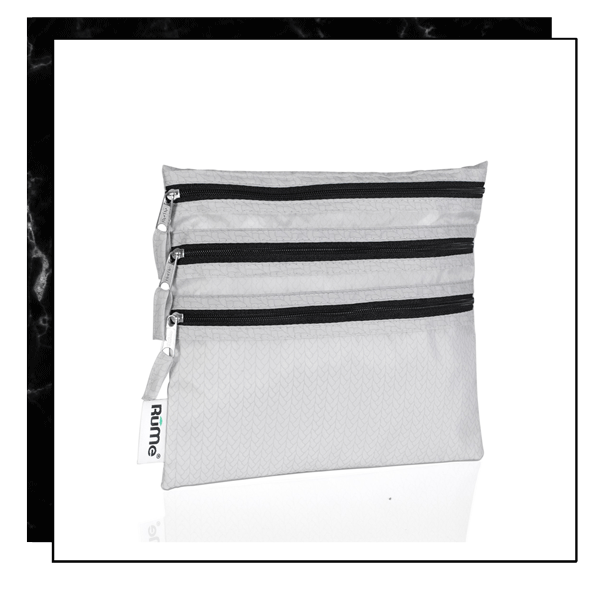 Every time you need any of these things throughout your trip, you simply reach for this little pouch in your RuMe. It’s all. right. there. Patiently waiting for you. Making travel easier, less stressful, more comfortable + more enjoyable comes down to a little organization. And organization comes down to having the right products. Trust me, I am NOT organized + travel has become a breeze because these two bags do all the heavy lifting. They streamline your whole experience. So don’t shy away from making those amazing life experiences. Don’t shy away from travel because you think it will be too stressful. Go see those people, go eat that food, go make those memories. As long as you have your RuMe’s with you, you’ll be all set. + + This post is sponsored but I really do LOVE my RuMe’s + fully stand behind them. P.M. Skincare: Get the Skin of Your Dreams.